When a kid is riding the balance bike, feet are always on the ground. There are no pedals, kids is constantly balancing on their legs,which can prevent them from gaining too much speed.They aee developing balance and coordination better than on any other kind of bike. When it comes time to transition to a two-wheeled bicycle with pedals, balance bikers do better, faster, and more securely than the training-wheeled kids. The balance bike requires minimal assembly and basically no maintenance. The handles and seat post are adjustable. No pedals and no brake mean no upkeep. Ensure that this balance bike is only used in suitable play areas and never near stairs, on steep ground or near swimming pools or other bodies of water. By the way,we advise you to use a helmet for kid's noggin when he/she is riding the bike. 12" EVA tires roll smoothly on even surfaces,designed for a quiet ride and long lasting durability. Thick cushion seat for a comfortable ride,gives your little baby more Considerate care. STYLISH INNER GIFT BOX---- Two boxes packing, sturdy outer box and stylish inner gift box, will give your kids a surprise. No shipping damage or missing parts. The best Christmas gift for kids. LIGHT WEIGHT & STRONG---- Only 5.76 lbs, the lightest design, kids can completely carry and control bike by themselves. 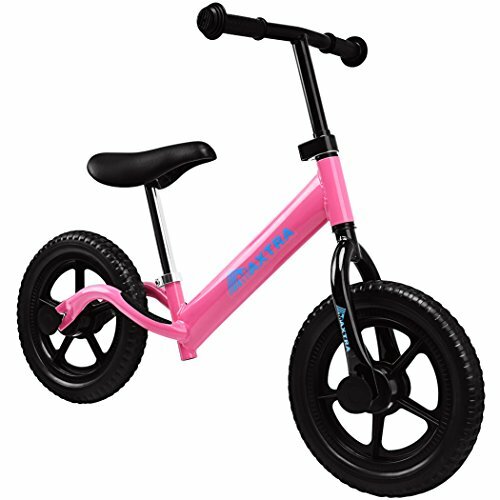 PUNCTURE PROOF EVA TYRES---- 12'' EVA tyres puncture proof and roll smoothly, designed for a quiet ride and long lasting durability, help kids to easily ride. ADJUSTABLE SEAT AND HANDLEBAR & PROTECTIVE DESIGN---- Adjustable design fits to difference height and physique kids, no worries that it can't be used. Protective design on the middle of front handlebar gives kids more security during cycling. EASY STEERING & GAIN CONFIDENCE---- Easy Steering cultivates confidence in children learning balance .Improves balance and coordination at crucial developmental stages, enabling a Seamless development towards a pedal bike. If you have any questions about this product by Maxtra, contact us by completing and submitting the form below. If you are looking for a specif part number, please include it with your message.